The History Center was added in 1991 to the original Mahler Museum. It has a large meeting room and houses permanent and temporary exhibits. 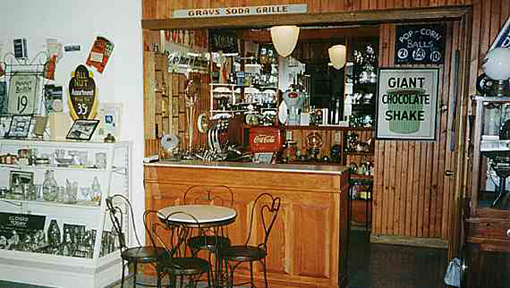 The Gray’s Candy Kitchen is located in the main meeting room and has the actual popcorn machine, soda fountain, chocolate molds and utensils from the original Gray’s Candy Kitchen. A Victorian Mansion Dollhouse located in the main meeting room demonstrates a variety of characteristics of the period from 1860 to 1910. It was created by Fr. Thomas Sheehan, M. Div. A model of the sandstone Berea Depot was built by Lee Vande Visse and donated by the owners of the Pufferbelly Ltd. restaurant, the current occupant of the depot. Stained Glass Windows from the chapel of the original Berea Children’s Home building and other Orphanage artifacts are also on display.